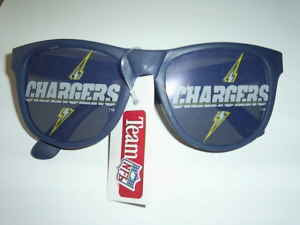 theAd>> San Diego Chargers SUNGLASSES ! ! San Diego Chargers novelty SUNGLASSES ! ! ! Show your Charger pride. Wear them, put them on your hat or hang them off your rear view mirror. First let me translate this Ad. Optical Studio sells these sh@$#y glasses for 6 bucks. They are so ugly that they have offered you two alternatives to actually placing them on your face. Show your chargers pride AND drive the Ladies Wild! That is why there running, right, they are WILD! ?